On a world known as Serin, a brazen young girl named Kari was fed up with her dead-end job as a barmaid. She drank away most of her nights, dreaming of fame, fortune and adventure beyond the confining walls of The Hollmig’s Den. She thought she was forsaken by the gods. Little did she know the gods had plans for her. Kari learns she is a just one of many pieces needed to solve The Serin Prophecy; a prophecy that could destroy her world. On a world known as Serin, in the Kingdom of Navaya, a majestic castle stood against a roaring sea on a rocky coast. This city, named Korvia, was the seat of power in this land. Deep in its great halls, a man walked with a feverish gait. "We are running out of time," Alcor said to the boy following him. His words echoed as they entered the library. Close behind him was Kale, his student, a man barely into adulthood trying his best to keep up. "What do you mean running out of time?" "Something happened again. The guide stars are changing. Something is very wrong." Alcor climbed a ladder looking for a particular book. He ran his finger down the dusty texts stopping at a thick unremarkable book. He took it from the shelf then threw it down to Kale. "Check the back of the book. Tell me if there is a map there." Kale thumbed quickly to the page. Alcor looked at the book with Kale. "That star! That's the one." "It's dimming faster than it should." Kale's face went white with fear. In his youth, a love of cinema forged Bryan into a lover of fantasy and science fiction. Later, books became the polish to the rougher edges of his mind. 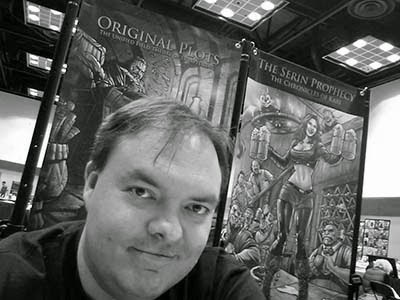 He thought about writing a screenplay but shelved the idea to create The Serin Prophecy series instead. He plans to continue his work on the fantasy novels (The plan is a six book series with other novellas focusing on important characters). He was recently recognized in USA Today for a nonfiction work called Original Plots: The Unified Field Theory of Storytelling. In his spare time he loves to camp and go to conventions. He currently lives in Indianapolis, IN. Thanks for reading! Please feel free to leave questions/comments below. If you like fantasy, check out these authors: Richie Earl, Vanessa Finaughty, G. Russell Gaynor, Dana Journey, Katy Krump and David Temrick.